Get ready, Disney Channel fans. There’s a new episode of Coop & Cami Ask the World airing Saturday, April 6 — and you’re not going to want to miss this one. Why? Well, Kim Possible leading ladies Sadie Stanley and Ciara Riley Wilson are guest starring! In the episode, Cami (played by Ruby Rose Turner) learns she didn’t make the dance squad because Tara (AKA Ciara) believes she is way too preoccupied with her Would You Wrather channel. So Cami has to prove she can do both. 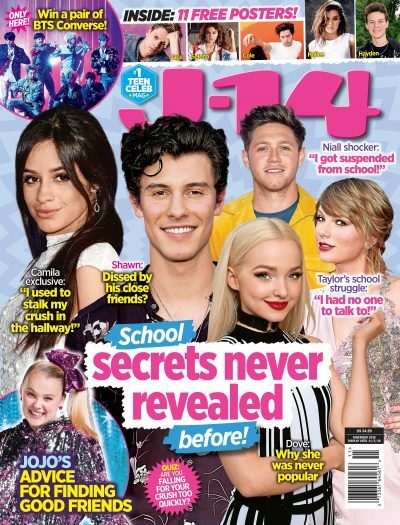 J-14 caught up with Ruby and Ciara all about the episode. And as it turns out, the two Disney Channel actresses go way back in real life! How cool is that?! The fact that these two got to work together again on Coop & Cami Ask the World is pretty awesome. “To be back dancing together again, but this time on Disney Channel, was really cool!” Ruby, 13, gushed. So how do these two balance dancing and acting, you ask? Ciara adds that it’s a bit challenging for her to balance both, but she seriously has a love for both. “I love being able to have both dance and acting as my passions. It can be challenging to juggle both at times, so I go through periods of focusing on one over another. When it’s a busy season for acting, I focus on that. When it slows down, I shift my focus to dance! However, in an ideal world I’d always combine the two. I love my role in Coop & Cami Ask the World because I have equal parts acting and dance,” Ciara told us. The new episode of Coop & Cami Ask the World airs on Disney Channel Saturday, April 6 at 10:30 a.m. ET. Check out our exclusive clip below! Taking It Back So What Exactly Happened In The Series Finale Of Your Fave Disney Channel Shows?